When is a chocolate a dark chocolate? I know there has been arguments with some cheaper chocolates not having enough cocoa to be labelled as milk chocolate, but the cocoa content always seems to be on a minimum level that needs to be reached. I’ve not seen an upper level as such. 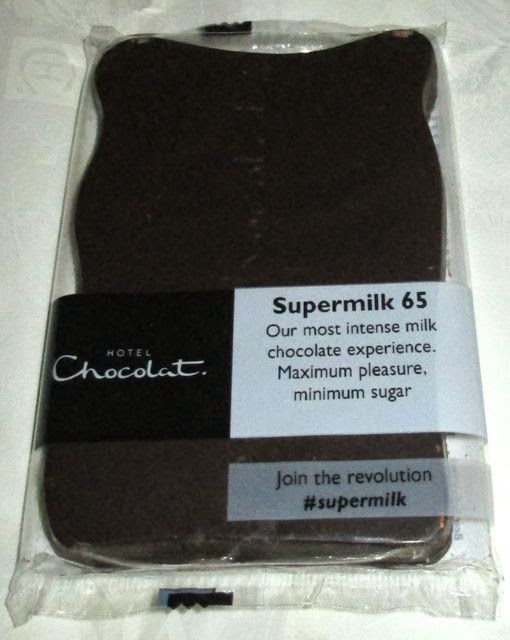 Given that the average milk chocolate in the UK has a meagre 25% cocoa this new Super Milk chocolate from Hotel Chocolat comes in at 65%, and looks rather dark too. It is still rather definitely described as being a milk chocolate, but admits to testing the formula by replacing sugar with extra cocoa, hence the dark colour. 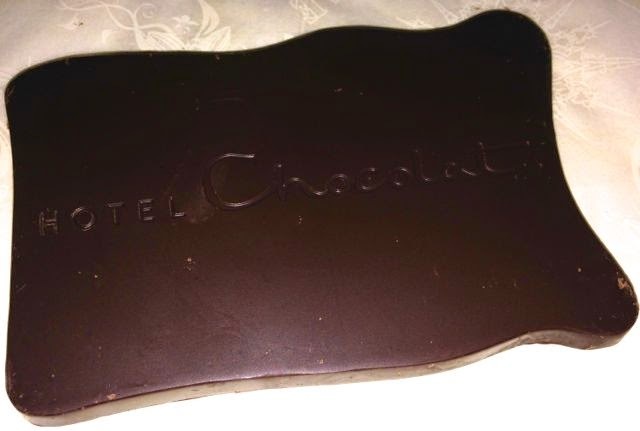 Inside the packet were two bars, both dark looking and embossed with the Hotel Chocolat branding. I broke a piece of the chocolate off and gave it a taste. It had a lovely thick melt, that felt quite soothing and was indeed reminiscent of a milk chocolate. The taste was different to what I expected. The cocoa flavour was quite strong, it is a strong flavoured bar, but impressively even with the reduced sugar content it was plenty sweet enough. I’m not sure I can say the bar was as creamy as a regular milk chocolate but it was far smoother than I expected, and did have a nice soft edge. The chocolate was in no way bitter, and in that respect did again feel like a milk chocolate, the cocoa had clearly been carefully chosen for it mellow flavour. The bar is without question really nice, but don’t go expecting the over-sweet and ultra creamy flavour you may associate with milk chocolate, this is a whole new twist on the concept. Hotel Chocolat have done it their way, and invented a remarkably smooth and tasty 65% cocoa bar, that mimics milk chocolate in a way you wouldn’t have thought possible, and its delicious too! Many thanks to Hotel Chocolat for the opportunity to try out their new SuperMilk Chocolate. Hi, What is the carb content, it seems strange that it can have less sugar, I still think it will have more carbs because of the lack of fibre, why haven't they published the nutritional information.